In Russia temperatures can drop to -30°C in winter and high up to 35 °C in the summer times. This is why local food should keep you warm during cold months and help you to stay refreshed on a hot days. 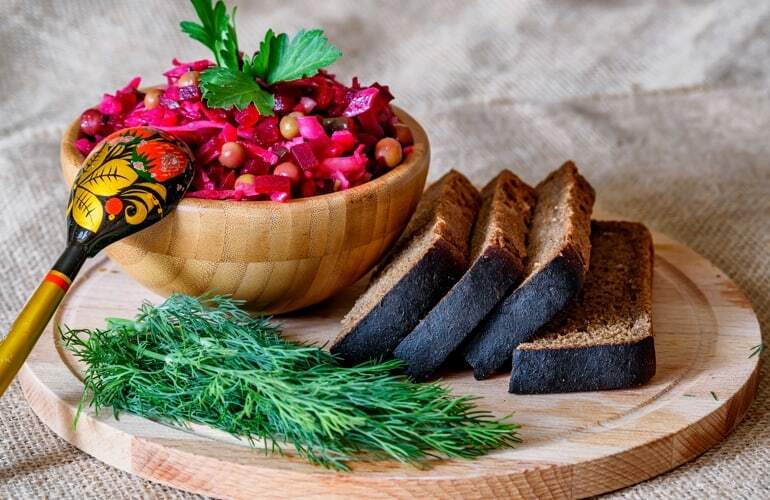 In spite of the common opinion, Russian cuisine has much more specialities besides vodka and caviar, and once you try it, you will not be able to resist the temptation. It is rich in various kinds of meat, potatoes, bread, sour cream, beetroot, delicious soups and salads. These are 6 Russian foods you definitely need to taste during your trip to the biggest country in the world. In Eastern culture soup takes a special place and it is always present in the fridge of every average family living in post-soviet countries - Russia, Ukraine, Belarus etc. There are dozens of recipes for various soups, but without any doubt the one, which is called borsch, is cooked more often than others. It is a soupe based on beatroot, with different vegetables added in: cabbage, potatoes, tomatoes, onions and carrot. 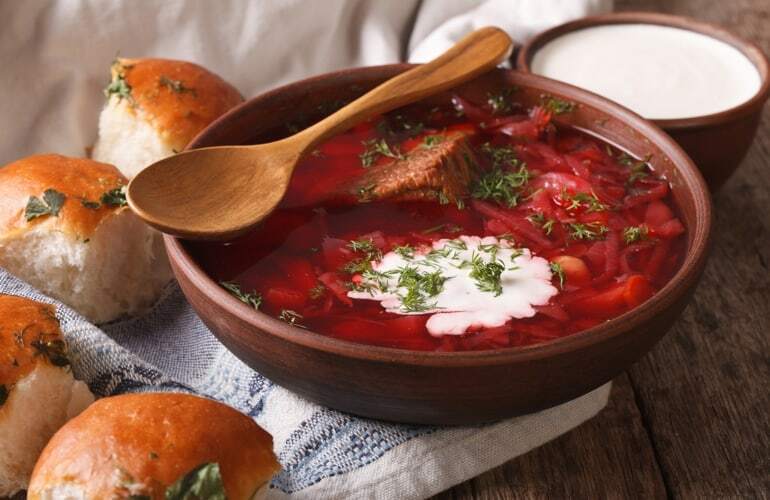 This red soupe can be vegetarian, but more often Russians prefer to cook it on the basis of meat bouillon, which is normally made from pork or beef. According to local traditions, soups are eaten every day for a lunch, before the main dish. We highly recommend you to add a spoon of smetana (sour cream) in your plate of borsch. Taste it also with pampushki, which are a variation of bread balls covered with a garlic sauce - veeeery tasty with a bowl of freshly cooked Russian borsch. 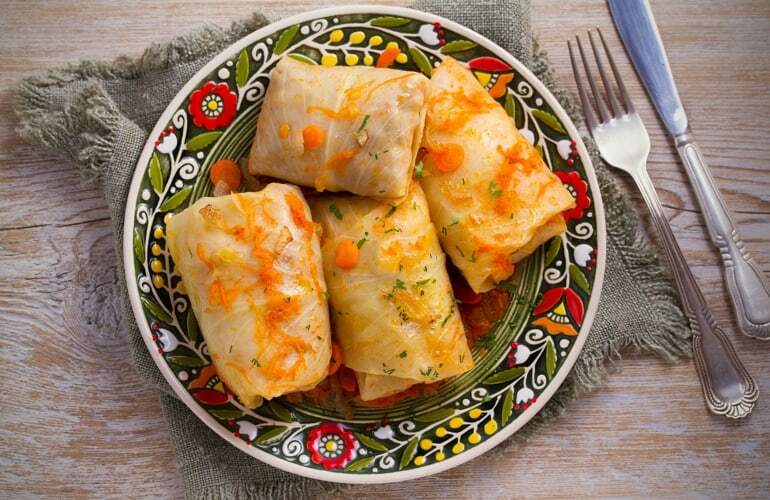 Golubtsy are cabbage rolls, stuffed with rise and small pieces of meat. Other fillings such as mushrooms, eggs, garlic and onion are often included. This dish reminds a little bit a greek dolma, but instead of wine leaves all the ingredients are covered with leaves of cabbage. Russian housewives go early morning on the market to choose the best head of white cabbage and the freshest sour cream, to serve golubtsy with. Beetroot is a common ingredient of a lot of dishes in post-Soviet states. Russian salad vinegret is made on the basis of this red vegetable mixed with potatoes, carrots, brined pickles, onions and green peens. All the ingredients are chopped into small pieces and boiled. In spite of the name (vinaigrette - a sauce used for salads) the Russian Vinegret is dressed only with a sunflower oil and some salt added. It is often served with Russian black bread and some kind of meat, such as pork or beef. More than soups russian people love to cook only salads. 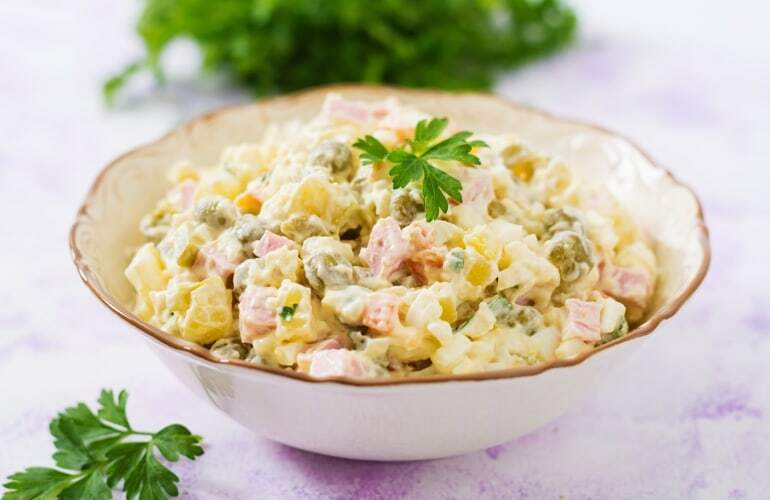 Olivier, contrary to its french name, is a typical Russian salad, which is traditionally a must-do dish for the New Year table. It consists of boiled chicken (or bologna sausage), potatoes, carrots, brined dill pickles, green peas, eggs, and onions. The salad is dressed with a lot of mayonnaise, so it is not the perfect representation of a healthy meal. Nevertheless, the taste will make you forget about the diet, as it is sooo tasty, so delicious, so russian! 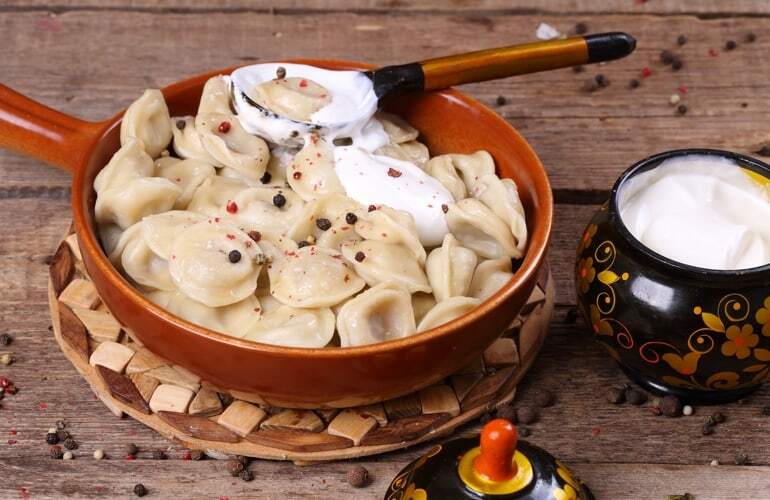 This sort of Russian dumplings, pelmeni, are a minced meat (which can be pork, beef or any other one) wrapped in thin dough, made from flour and water. They can remind Polish pierogi, but the difference is that pelmeni are never served with a sweet filling. As you already understood, Russians like a sour cream a lot, and they often add it to their dishes. And this is understandable, as smetana goes so well with hot, fragrant, just-cooked pelmeni. Do not miss a chance to try this dish, as it is so tasty, that you will ask the second portion for sure! Sauteed pieces of beef served in smetana are one of the best known Russian dishes in the world. Tender meat with flavorful mushrooms, stewed in a creamy sauce will make your heart to beat faster. 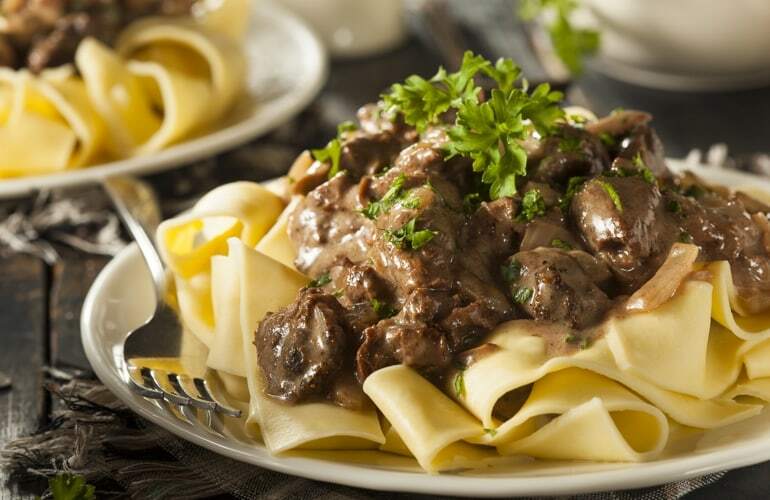 What is interesting, Russians themselves do not cook Stroganoff that often, however they know how to do it well and serve this yummy dish in the majority of restaurants.